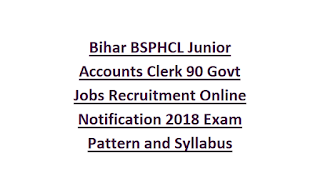 Bihar BSPHCL Junior Accounts Clerk Jobs Recruitment/Exam Pattern and Syllabus-2018: Bihar State Power holdings Company Ltd BSPHCL released notification for the recruitment of Junior Accounts Clerk posts in BSPHCL and its subsidiary companies of NBPDCL, SBPDCL, BSPTCL, BSPGCL. There are total 350 posts in this BSPHCL Jr Accounts Clerk recruitment 2018. Graduate in Commerce candidates are eligible to apply online for this BSPHCL Junior Accounts Clerk Jobs. Online applications for this BSPHCL Jr Accounts Asst vacancies are will be available from 11-05-2018 to 31-05-2018 through the BSPHCL official website of www.bsphcl.bih.nic.in. Candidates selection for this BSPHCL Junior Accounts Clerk jobs will be based on single stage written exam only. If applications are received more than 15000 for this BSPHCL Junior Accounts Clerk jobs a preliminary exam will be conducted. Prelims exam syllabus and mains exam syllabus is same but paper difficulty level different for this Bihar BSPHCL Junior Accounts Clerk recruitment. 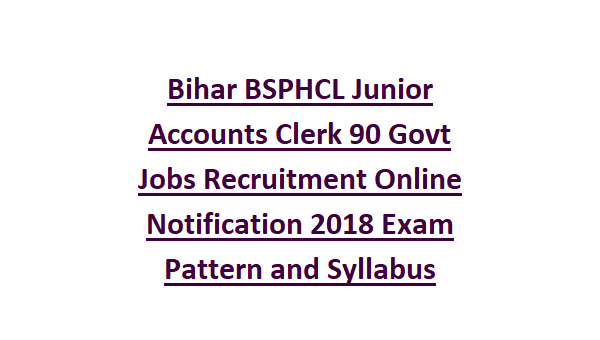 More details of Bihar BSPHCL Jr Accounts Clerk 90 Govt Jobs Recruitment Online Notification 2018 Exam Pattern and Syllabus, community wise vacancies, mode of selection, online application form submission process, important dates and other details are given below. Exam Date, admit card released dates will be updated later. There are total 350 posts in this Bihar BSPHCL recruitment 2018. As on 01-01-2018 minimum age for all the candidates is 21 years. Upper age limit for general is 37 years, for SC/ST 42 years, EBC/BC/Female UR 40 years. Commerce Degree completed candidates are eligible for applying this Jr Accounts clerk jobs. Selected candidates will receive Pay Band - Rs.9200-15500 which is level 4. Selected candidates have to serve any one of the BSPHCL subsidiary company for at least 2 years under probationary period. Candidates selection will be based on written exam only for this Junior Accounts Clerk jobs. If applications are received more than 15000 then preliminary exam will be conducted. or else Mains exam only conducted. If prelims exam conducted 1:20 ratio candidates will be shortlisted for Mains exam. Exam syllabus topics are given below. Online applications only accepted for this BSPHCL recruitment of Junior Accounts Clerk posts. Last date to apply online for this Bihar Jr Accounts Clerk jobs is 31-05-2018.